From Goodreads ~ In early 2012, Jim Tselikis visited L.A. and met up with his cousin, Sabin Lomac. Over a few drinks, they waxed nostalgic about their childhood in Maine, surrounded by family, often elbow deep in delicious lobster while gathered around the picnic table. 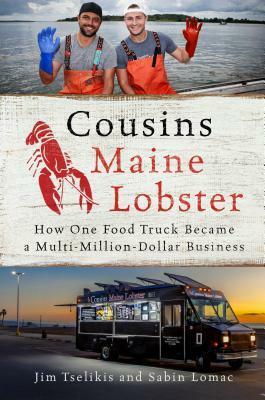 From this strong memory was born the very first Cousins Maine Lobster food truck. Smart, authentic marketing, and sustainable, delicious ingredients helped turn that one food truck into an overnight sensation. Then, in just three years, they went from a single food truck to a nationally-franchised legion of trucks, an online delivery service, and a brick-and-mortar restaurant, grossing over $15 million dollars in sales a year. Start-up fever has taken hold of America and there are hundreds of books to teach readers how to become an entrepreneur; this is the first book to answer the question: What's next? At each step, Jim and Sabin were faced with hard decisions--opening each new food truck carefully instead of rushing to meet the demand; turning down a six-figure franchise offer because it came from someone who didn't support their vision; turning down Shark Tank (twice) until they could insist on participating only if Barbara Corcoran was one of the Sharks. Now Jim and Sabin teach readers how they, too, can reach the next level of success in their own businesses, without having to compromise themselves. Jim and Sabin are cousins but over the years, they'd lost touch with each other ... Jim lived in Boston and Sabin lived in L.A. Jim was heading out to California on vacation to visit a friend and thought he'd touch base with his long-lost cousin, Sabin, who lived in Los Angles. When they got together, there was much reminiscing about the lobster boils with family when they were kids. They decided they wanted to recreate the same experience for people in California. The Cousins Maine Lobster food truck was born, giving L.A. customers a Maine lobster shack experience, serving lobster rolls with fresh lobster all the way from Maine. They were approached to appear on Shark Tank (I remember seeing when they were on the show and that's what made me interesting in reading this book) and ended up with a deal with Barbara Corcoran ... $55,000 for 15% of their business. Six years later, their company consists of 21 food trucks in 13 cities, a restaurant in West Hollywood and an online retail business, all of which has earned over $20 million in sales. This book is their story. They discuss the history of the Maine and New England fishing and lobster industry, how they got started, how they continue to grow, preparing for Shark Tank and targeting Barbara, their failures and successes, franchising, how important it is to incorporate family values, trust and loyalty in their business when dealing with employees, customers and/or suppliers, and giving back (Cousins for a Cause partnering with Big Brothers Big Sisters of Los Angeles). I thought it was an interesting story. It's amazing how far they've come in such a short amount of time from one food truck and they seem to be extremely dedicated hard workers. It also sounds like they have stayed true to their Maine roots ... family values, a strong work ethic and a connection to the community. As a head's up, there is swearing.